Home > Blog > Happy Third of July! Tomorrow is our nation’s Independence Day! Our country is chock-full of national monuments. From the Golden Gate Bridge to the Washington Monument, the Lincoln Memorial and Mount Rushmore, you can look to many different things that carry symbolism for our country. We’ve been ramping up for this holiday at Everything Summer Camp with our patriotic Seasonal Trunks dressed up in red, white, and blue. And with the Fourth of July now just one day away, I’ve selected four well-recognized symbols of our nation to dissect and explain the reasoning behind them in celebration today. In order to express a sense of identification and reputation, nations select their own national tree, flower, bird, etc. 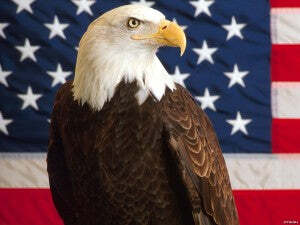 The bald eagle is the national bird of the United Sta tes. It was chosen to represent the freedom, strength, and independence of American life. At the time, the Bald Eagle was thought to inhabit exclusively the North American continent and—despite Benjamin Franklin’s lobbying for the turkey–the strength and majesty of the Bald Eagle won this bird its place to represent our nation. When the Declaration of Independence was signed in Philadelphia, 1776, our forefathers were obliged to read the document to the pu blic. 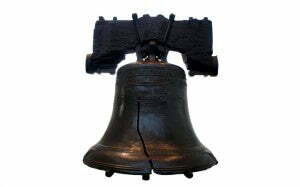 In order to gather the colonials in the town center, they rang the Liberty Bell. Still in existence more than 240 years later, The Liberty Bell still exists to this day and can be seen on display at the Liberty Bell Center in Pennsylvania. It was cracked some time in the 1800s (with vague record) but continued to travel the country for town gatherings on the Fourth of July until 1915. Like a guardian angel, The Statue of Liberty towers over the New York islands as one of our nation’s most recognizable monuments. 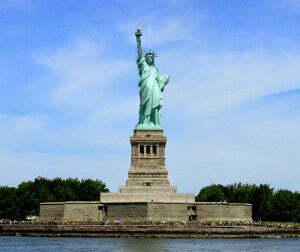 Lady Liberty was constructed in France as a gift to the U.S. Built of a steel frame and covered in sheets of copper the statue took about a decade to be completed. It was then disassembled and shipped to the New York Harbor where it was then put back together again over the course of several months. Designed after the Roman goddess, Libertas, she continues to be a strong symbol of our country’s freedom. Featuring 13 red and white stripes and 50 stars to symbolize the 50 states and 13 original colonies, the American Flag is an incredibly iconic image, but it hasn’t always looked the same. 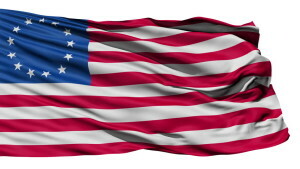 Modernly known as the Betsy- Ross Flag or Colonial Flag, the American Flag was changed more than 25 times as stars continued to be added as territories were annexed into states. We finally designed our modern flag in 1960 after Hawaii, our 50th state, was granted its statehood. The more you know, the more you can appreciate the historic significance behind our nation’s most iconic symbols. You can also look into previous posts about the history of our Independence Day by clicking here and, as always, thanks for reading.